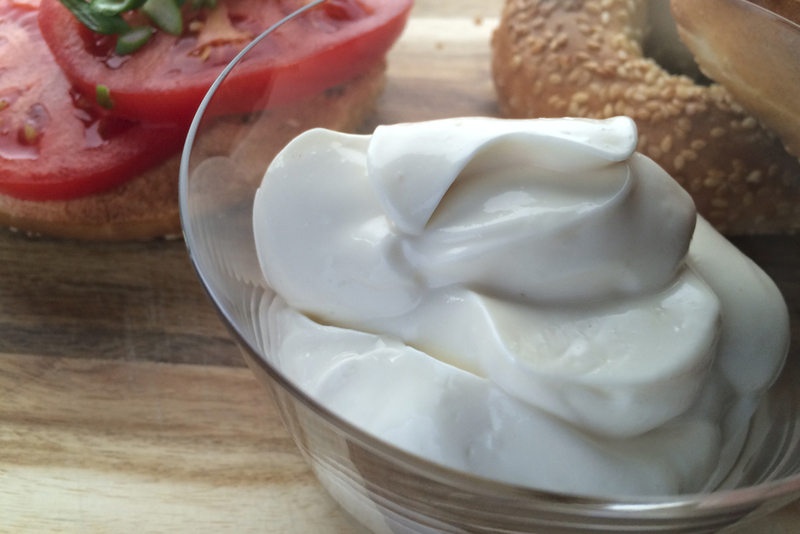 Way better than store bought, this homemade vegan mayonnaise is amazing, healthy and easy to do. It’s really when adding lemon juice that magic happens! Also put all your ingredients in the fridge in advance so that the oil and milk of soy are very cold, this will facilitate the emulsion. Important: If mayonnaise doesn’t thicken: 1- Start the process by using a small amount of the thin or broken mayonnaise and emulsify with the remaining oil. 2- Add alternately the remaining mixture that has not thicken and oil. 3- Use more oil than the recipe calls for if necessary. Place all ingredients except the oil and lemon juice in a cup suitable for immersion blender or in a blender. Mix by gradually incorporating the oil to create an emulsion. When the mayonnaise begins to thicken add lemon juice. I find that when I add lemon/lemon powder early on in the emulsifying process it thickens faster and less oil is required. Of course the milk has to be super chilled too. How long will this keep in the fridge? Thanks! It keeps for 5 days. Can I use a different type of milk other then soy? for instance coconut or cashew? I’m not sure about the coconut milk but cashew should work! I was disappointed as this was the third vegan mayo recipe I’ve tried and I can never seem to get it to thicken. I used an immersion blender and even added more oil. I finally added a few Tbsp of vegan cream cheese and some apple cider vinegar. This thickened it somewhat, but was a lot of work. Is there any mayo recipes without the oil? Great receipe! The mayonaise is so thick. I used it for Aioli by adding garlic, more lemonjuice, salt and pepper. Perfect with fresh ciabatta! Thanks a lot !!!! This recipe is perfect for me : I’m vegan, but I’m also celiac, with a corn allergy …Because of these so most of the mayonnaise are not allowed for me [ most of them, have corn ] …thanks again !!! Hi! Can I use extra virgin oil instead of vegetable oil? Thanks! Well that didn’t work at all. I did like you said, but it wouldn’t thicken. I tried look for tips on how to thicken it but could find anything that worked. Well that’s newly half a bottle of good oil waisted. Instead of soy milk try it with 5oz of soft tofu ! It’s magic and thickened faster. What would you add to make it a spicy or chipotle mayo? Hi, we have followed the recipe and bottled in two bottles, but for some reason after two days the mayo breaks up into curd and another bottle is bursting out. any advise is much appreciated. Wow, Ijust made this because we needed mayo RIGHT NOW but had run out of veganaise. It was fast, easy, and all the ingredients were on hand. And of course it’s delicious! I’m looking forward to seeing how well it keeps in the fridge. Also, for anyone using an immersion blender who is having trouble getting it to thicken, I found that my mayo wasn’t thickening when I held the blender flat against the bottom of the container. Then I held on a slight angle, and BOOM. Thickening magic. Maybe it was a coincidence, maybe not. For the people who can’t have or don’t want soy… I substituted aquafaba (the brine from a can of cooked chick peas- this stuff is liquid gold) for the soy milk and this is the BEST vegan mayo I have had yet!! Tastes like the real deal! I followed the rest of the ingredients to a T. Perfect amounts of each ingredient to give it that real mayo flavour. I’m sure my family won’t know the difference.